The Purpose Of The Thumb: Creating a Power Punch? To the question, “What is the purpose of the thumb?” Answers.com/Wiki Answers says, “To put opposing pressure against the fingers enabling the hand and fingers to grip, climb, or make a fist.” Take a second and look at your hand, palm facing you. All four fingers are facing your direction. They are distinctly different in length: pointer, middle, ring, and pinky fingers. The thumb does not face you; it faces the four fingers for the purpose of applying “pressure against the fingers” enabling the “hand” to “grip, climb, or make a fist.” It is a process involving all five. In the five fold gifting, passion, and point of view, I see the apostle like a thumb, it “sees over” the other four fingers, yet can not be effective unless it works with them, serves “pressure” for them, then “releases” that pressure. It cannot apply pressure on all four at one time, only on the finger needed for the specific function at the specific time. 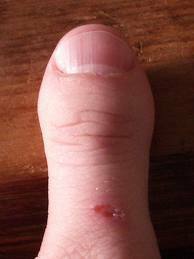 The thumb cannot do the work alone; it needs another finger! They key for the thumb is knowing when to “apply” pressure and when to “release” it to allow the finger to be on its own. It is amazing though, that the only way the hand can “receive” is when all five are extended wide open. When all five are extended it can catch larger objects, hold them, and release them when necessary. I have seen hands upraised toward heaven, fingers extended, reaching, waiting to grasp what the hand of God is ready to release to them as an “act of worship.” Extended hands in worship are beautiful, and when done in unity in a corporate setting, phenomenally awesome! But to grasp all that the Lord wants to give them, all five fingers have to collapse around the object to grasp, have a grip, or hold what has been given to them. If one of them does not cooperate, it is easy to drop the object, never getting a firm grip on the object, and sometimes totally missing the object. All five working together can grab a hold of and grip the fullness of God corporately. When one of the five does not cooperate with the other four, the hand is severely crippled and nothing can be held effectively. In a fist, the thumb naturally lays over the other four fingers, protecting them, keeping them together, applying pressure to keep them all in place. When “googling” the word “fist”, I got the definition: “Noun: A person’s hand when the fingers are bent in toward the palm and held there tightly, typically in order to strike a blow or graps.” A fist is powerful, and the Body of Christ, the Church, needs the thumb, the apostle to “lay over” the fingers in protection, creating power when all five fingers bow with one another. In unity there is “power”! The Church will manifest its “power” when all five fingers, all five gifting, passions, and points of view bow together under the Lordship of Jesus Christ. Satan cannot survive a power punch from the “hand of God”, His Church, when all five are working in unity together. Jesus said that “a kingdom divided can not stand”, and if all five do not bow together (to his Lordship), and even one rebels refusing to bow, you can not have a fist! The power of the punch is totally lost. In terms of spiritual warfare, the Church needs a punch of unity, a punch of power, a punch created by all those in the Body of Christ, no matter what gifting, passion, or point of view, bowing together. Satan and his kingdom of darkness has no defense for that kind of punch. The fullness of Christ with his death on the Cross and resurrection from the grave completed the fullness of Christ on earth, a punch Satan could not stand, for as Jesus said, “It is finished” when he died on the cross. That “fullness in Christ” is in the “hand of God” when Jesus “released” it into the “hands of God”, his Father, who then released it in the form of the Holy Spirit of Jesus Christ on to the Church. The Church has the potential for knock out punches every time the five fold works in unity. The fullness of Christ was exposed at the Cross when the supernatural (the vertical), God’s only Son, died, “laying down his life for our sins” while penetrating the natural world (the horizontal) creating the Cross. That same supernatural power can penetrate today’s natural world effectively when all five passions, and points of view are willing to “lay down their lives for their brethren,” laying down the horizontal arm of the Cross. The Church has been given the “fullness of Christ” vertically and horizontally: the CROSS! God’s love is shown both vertically and horizontally. With the recognition of, the maturing and developing of, and the releasing of the apostle in to the Church, the Church will again see the protection, the “seeing over” what the Holy Spirit of Jesus is doing, again! The restoration of the apostle in the five fold is crucial if the “hand of God” is to work with all five fingers! Older PostThe Hand Of God: What Does It Look Like?